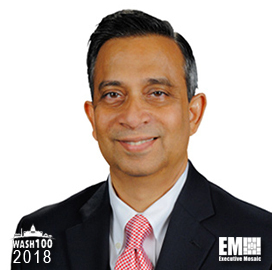 Executive Mosaic is pleased to announce PV Puvvada, President of Federal Systems at Unisys, has been inducted into the 2018 edition of the Wash100 — Executive Mosaic’s annual selection of the most influential voices in the government contracting arena — for his leadership driving IT modernization. This marks his fourth time receiving the award, having also been selected in 2014, 2016 and 2017. For his efforts, Puvvada was selected to chair the Professional Services Council’s board of directors in December. “Working with PSC members and key government stakeholders, we will continue our mission to enable a more fair and competitive government contracting industry in 2018 and beyond,” he said followed his appointment. Puvvada has also served as chair of Unisys’ Civilian Agencies Council, and is a Fed 100 Award Eagle Winner, and regular contributor to Federal News Radio and FCW.